I sincerely doubt I'll make doing a post after every game a habit, but today was Opening Day and there are rules somewhere that say a blogger must write about the first game of his/her team's season. Since I don't want to get my wrist slapped, I am currently writing up that very post. There probably weren't very many fans that didn't either watch or listen to the game. 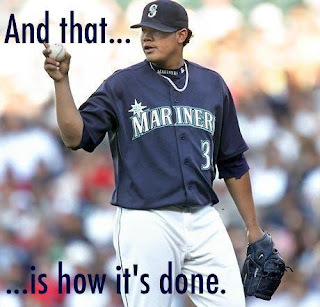 Rather than going through every little part of the game, we'll just talk about how awesome King Felix Hernandez is and how Brett Anderson nearly ruined it for Mariner fans. And.....jump! The $175 million dollar man did what he does best. That's not surprising considering the money, but he took the Athletics behind the Coliseum and gave all the Oakland players a bit of a bloody nose. Except John Jaso. Jaso got a Rolex for catching Felix's perfect game last year and then broke up Felix's groove by driving a double to center in the bottom of the fourth. I never liked Jaso anyway. Felix worked quickly and kept his pitch count pretty well in check until Jaso fouled off 20 pitches in an inning. That's exaggeration, slightly. After Jaso's at bat in the 6th, there was some question whether or not Felix would actually make it to the 8th, but the Athletics did their best to oblige and went down in order on less than 10 pitches. Felix came out for the 8th and got the first two outs before allowing a double to Seth Smith and walking Eric Sogard. Then came Charlie Furbush to face Coco Crisp and decided to walk the always dangerous and powerful Crisp. With Derek Norris on to pinch hit for Jaso, Wedge went back to the pen to get Stephen Pryor. Pryor got Norris to ground out with the bases juiced and everybody raised the carbon dioxide level in the Pacific Northwest by several percentage points when they exhaled in unison. Tom Wilhelmsen did what he was supposed to do and shut the door on the Athletics, but not before playing an April fool's joke on everybody by walking Jed Lowrie and getting therapist's everywhere a session or two on the books for Tuesday. On the offensive side of the ball, there wasn't a whole lot to talk about. Brendan Ryan got on base all three times he was at the plate with two walks and a single. To add a little icing to the day, he even stole second in the top of the 7th. It ended up going for naught as Franklin Gutierrez flied out to end the top half. Gutierrez did, however, drive in the two runs that won the game for Seattle, driving a ball back up the middle to score Dustin Ackley and Ryan in the top of the 5th. After that, it was fairly smooth sailing for Felix and company, save for an ulcer inducing moment or two. The rest of the hitters didn't do much, but that was more a product of Anderson's slider than any kind of ineptitude on the part of the hitters. Although, it would be grand if starting the game with 4 consecutive strikeouts didn't become a habit. The start of the season is FINALLY here and Seattle has won yet another Opening Day. As evidenced from past experience, it bodes well for the rest of the season. Because as you know, they also won the first game in 2008 and 2009, so there's precedent for high expectations after one game. I kid, I kid. With the roster the Mariners have this season, 2013 may end with fans not wanting to scoop their eyeballs out with a spoon or getting a lobotomy to forget what a Mariner might be and what this game of baseball is of which you speak. Tuesday is game 2 in the series with Jarrod Parker going up against Hisashi Iwakuma at 7:05pm Pacific time.